A short biography of German council communist tool maker-turned academic Paul Mattick. Born in Pomerania in 1904 and raised in Berlin by class-conscious parents, Mattick was already at the age of 14 a member of the Spartacists’ Freie Sozialistiche Jugend. In 1918, he started to train as a toolmaker at Siemens, where he was also elected as the apprentices’ delegate on the workers’ council of the company during the German revolution. Implicated in many actions during the revolution, arrested several times and threatened with death, Mattick radicalized along the left and oppositional trend of the German communists. After the ‘Heidelberg’ split of the KPD(Spartacus) and the formation for the KAPD in the spring of 1920, he entered the KAPD and worked in the youth organization Rote Jugend, writing for its journal. In 1921 – at the age of 17 – Mattick moved to Cologne to find work with Klockner for a while, until strikes, insurrections and a new arrest destroyed every prospect of employment. He was active as an organizer and agitator in the revolutionary organisations KAPD and the AAU in the Cologne region, where he got to know [url =/tags/jan-appel]] Jan Appel [/URL] among others. Contacts were also established with intellectuals, writers and artists working in the AAUE founded by Otto Ruhle. With the continuing decline of radical mass struggle and revolutionary hopes – especially after 1923 – and having been unemployed for a number of years, Mattick emigrated to the United States in 1926, whilst still maintaining contacts with the KAPD and the AAU in Germany. In the USA, Mattick carried through a more systematic theoretical study, above all of Karl Marx. In addition, the publication of Henryk Grossmann’s principal work, Das Akkumulations – and Zusammenbruchsgesetz des Kapitalistischen Systems (1929), played a fundamental role for Mattick, as Grossmann brought Marx’s theory of accumulation, which had been completely forgotten, back to the centre of debate in the workers’ movement. To Mattick, Marx’s ‘critique of political economy’ became not a purely theoretical matter but rather directly connected to his own revolutionary practice. From this time, Mattick focused on Marx’s theory of capitalist development and its inner logic of contradictions inevitably growing to crisis as the foundation of all political thoughts with the workers’ movement. Towards the end of the 20’s Mattick had moved to Chicago, where he first tried to unite the different German workers’ organisations. In 1931, he tried to revive the Chicagoer Arbeiterzeitung, a newspaper steeped in tradition and at one time edited by August Spies and Joseph Dietzgen, but without success. For a period he joined the Industrial Workers of the World, who were the only revolutionary union organization existing in America which, in spite of national or sectoral differences, assembled all workers in One Big Union, so as to prepare the general strike to bring down capitalism. However, the golden age of the Wobblies’ militant strikes had already passed by the beginning of the thirties, and only the emerging unemployed movement again gave the IWW a brief regional development. In 1933 Paul Mattick drafted a programe for the IWW trying to give the Wobblies a more solid ‘Marxist’ foundation based on Grossman’s theory, although it did not improve the organization’s condition. After some unsuccessful attempts to exercise an influence from the outside on the Leninist Proletarian Party, Mattick finally founded a council communist group, the United Workers Party of America in 1934 with some friends who were originally from the IWW as well as with some expelled members of the PP. The group kept close contacts with the remaining small groups of the German/Dutch left communism in Europe and published the journal International Council Correspondence, which up though the 30’s became an Anglo-American parallel to the Rätekorrespondenz from the Dutch GIC(H). Articles and debates from Europe were translated along with economic analysis and critical political comments of current issues in the US and elsewhere in the world. Apart from his own factory work, Mattick organized not only most of the review’s technical work but was also the author of the greater part of the contributions which appeared in it. Among the few willing to offer regular contributions was Karl Korsch, with whom Mattick had come into contact in 1935 and who remained a personal friend for many years from the time of his emigration to the United States at the end of 1936. As the European ‘council communism’ went underground and formally ‘disappeared’ in the second half of the 30’s, Mattick let ‘Correspondence’ change its name – from 1938 to Living Marxism, and from 1942 to New Essays. Through Karl Korsch and Henryk Grossman, Mattick also had some contact to Horkheimer’s Institut fur Sozialforschung (the later ‘Frankfurt School’). In 1936 he wrote a major sociological study on the American unemployed movement for the Institue, althought it remained in the Institute’s files, to be published only in 1969 by the Students for a Democratic Society publishing house Neue Kritik. After the United States’ entry into the Second World War and the consequent persecution campaign directed against the entire critical intelligentsia, the left in America was liquidated by McCarthyism. Mattick retired, at the beginning of the 50’s, to the countryside, where he managed to survive through occasional jobs and his activity as a writer. In the postwar development Mattick – like others – made only small and occassional political activities, writing small articles for various periodicals from time to time. From the 40’s and up through the 50’s Mattick went through a study of Keynes, and compiled a series of critical notes and articles against Keynesian theory and practice. In this work he developed Marx’s and Grossman’s theory of capitalist development further to meet the new phenomenons and appearences of the modern capitalism critically. With the general changes of political scene and the re-emergence of more radical thought in the 60’s Mattick made some more extensive and important contributions. One main work was ‘Marx and Keynes: The Limits of Mixed Economy’ from 1969, which was translated into several languages and had quite an influence in the post-68 student movement. Another important work was ‘Critique of Herbert Marcuse – The one-dimensional man in class society’, in which Mattick forcefully rejected the thesis according to which the “proletariat”, as Marx understood it had become a “mythological concept” in advanced capitalist society. Although he agreed with Marcuse’s critical analysis of the ruling ideology, Mattick demonstrated that the theory of one dimensionality itself existed only as ideology. Marcuse subsequentially affirmed that Mattick’s critique was the only serious one to which his book was subjected. Up through the 70’s a lot of old and new articles were published in different languages for various publications. In the academic year 1974-75 Mattick was engaged as ‘visiting professor’ at the ‘red’ University-Center of Roskilde in Denmark. Here he held lectures on Marx’s critique of political economy, on the history of the workers movement and served as critical co-referent at seminars with other guests such as Maximilian Rubel, Ernest Mandel, Joan Robinson and others. In 1977, he completed his last important lecture tour of the University of Mexico City. He spoke in West Germany only twice: in 1971 at Berlin and in 1975 at Hanover. In his last years Paul Mattick thus succeeded in getting an audience in new generations for his views. In 1978 a major collection of articles from over 40 years appeared as ‘Anti-Bolshevik Communism’. 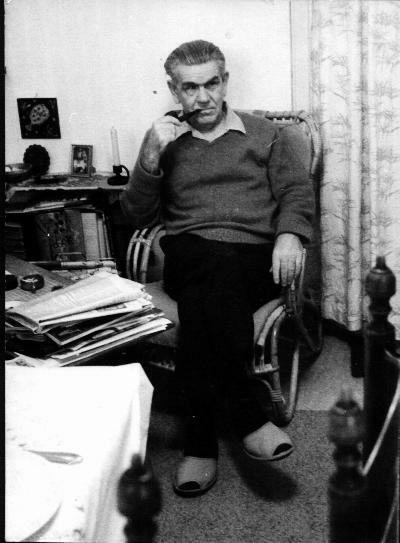 Paul Mattick died in February 1981 leaving an almost finished manuscript for another book, which was laler edited and published by his son, Paul Mattick Jr., as ‘Marxism – Last Refuge of the Bourgeoisie?’. After some unsuccessful attempts to exercise an influence from the outside on the Leninist United Workers Party, Mattick finally founded a council communist group in 1934 with some friends who were originally from the IWW as well as with some expelled members of the UWP. In fact, as Paul Mattick states (http://www.marxists.org/subject/left-wing/icc/introduction.htm), it was members of the IWW and members of the Proletarian Party--not the United Workers Party--that added to the membership of the council communist group. The United Workers Party was actually the initial name of Mattick's council communist group (see http://libcom.org/forums/history-culture/program-united-workers-party-us-1934-25072010). Perhaps this could be corrected. A French translation of this book has just been published by Editions L'Echappée - 'La révolution fut une belle aventure. Des rues de Berlin en révolte aux mouvements radicaux Américains (1918-1934)'. It's a fascinating account of Mattick's life and activity in his own words drawn from lengthy interviews. A final chapter which (unlike the chapters of autobiography) preserves the interview format offers some political reflections. There's a postface by Laure Batier and Charles Reeve (who also, I think, produced the footnotes) a brief chronology and a bibliography of works by Mattick in French. Really ought to be translated. So just finished reading Gary Roth's biography of Paul Mattick senior and it just grew my interest as it progressed all the way through from the era of the 'German Revolution' through to the 'cold war' and today. Perhaps a bit like Mattick I've always taken more interest in the political content and action of the people who influenced me than their particular personal histories, but I found the material in the book recounting the personal and political connections with so many of my listed key influences from both the early Council Communist movement and beyond beneficial in explaining the interconnectedness of various critical currents in the development of my own thinking. Far too many names to mention them all but in particular for me Korsch, Pannekoek, Ruhle, Meijer, Rubel, Fromm, Aldred together with familiar references to publications and movements that regenerated interest in Mattick's works in the 60's that brought me and others to their attention. Highly recommended!